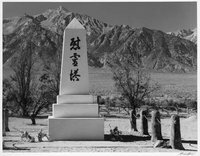 The Gardena Valley Japanese Cultural Institute (GVJCI) will be offering a charter bus for individuals and families to attend the annual pilgrimage to the Manzanar National Historic Site in the Owens Valley. The 2013 Pilgrimage will take place on Saturday, April 27. The Manzanar Pilgrimage, a public program now in its 44th year, commemorates the internment of over 120,000 Japanese Americans and persons of Japanese ancestry during WWII. The keynote speaker for this year's program will be Karen Korematsu , daughter of Fred Korematsu and co-founder of the Fred T. Korematsu Institute for Civil Rights and Education. At the program, long-time public servant, community leader, and grass-roots activist Warren Furutani , one of the co-founders of the first organized Manzanar Pilgrimage in 1969, and of the Manzanar Committee, will be awarded the Sue Kunitomi Embrey Legacy Award. Click here to download the itinerary and registration form . GVJCI . Atualizado em Abr 16 2013 5:30 p.m.